This is a story centered around a few friends who were raised in a small town, went their own ways and then come back together for a wedding. I lived in a small town for a few years as a teen, so I could relate somewhat to this story. I’ve known a Kip, a Ronny, a Leland, a Hank and a Beth. I know that the author nailed the people and life of a small town. It’s told by alternating characters, which I thought would be strange, but didn’t take away from the story at all. The story moves at a steady pace, then slows for a teeny bit, and then picks up again. Even through the slow part, I never lost interest. The characters were well written and I enjoyed them all, as well as every aspect of their relationships…the good and the bad parts. The book made me feel so many different emotions. The characters portrayed love, sorrow, happiness, hope and disappointment. This is a really good book that will be in my head for a while. It brought back so many good memories of living in a small town and I was so drawn to what was going on and to the characters that I was sad when I was finished. I hope the author has plans to bring these characters back in a future book. Either way, I look forward to more from Nickolas Butler. I listened to the audio cd version of this book, which had multiple narrators. Since I’m so picky when it comes to narrators, I wasn’t sure how I’d be able to handle listening to this. I was pleasantly surprised. None of the voices grated on my nerves or made me want to turn it off. The author did good on choosing all the narrators, and now I have some more names to add to my listenable list! 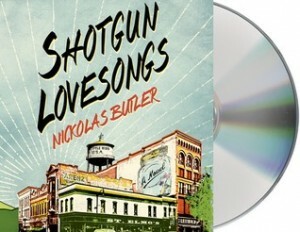 Vicki, I’m glad that you were pleasantly surprised, and enjoyed listening to Shotgun Lovesongs. It sounds like the characters made the story worthwhile for you. Yes, the characters where awesome! Although we live in a pretty rural area now and there are plenty of small villages and communities around us, where the locals seldom venture too far from home, our own hometown is quite a lot larger, although still spoken of in the terms of being a ‘market town’. I have always been used to living somewhere where I can remain anonymous when I want to and where not everyone knows all about myself, my family and my business …. I would hate that. Although I am not a fan of audiobooks, I quite agree that you really do need the right narrator to carry off the storytelling well, which in many respects makes the putting together of an audio version of a book, even more difficult than the printed version. Although this probably isn’t a book that would jump off the shelf at me, I am pleased that you obviously enjoyed it so much. Everyone knowing everything about you and your family has it’s good points, but also can be a pain sometimes. I heard good things about the audio and checked this out of the library but I had to return it before I got a chance to listen. Thanks for reminding me to put it on hold again!